My 400th post, what a journey! 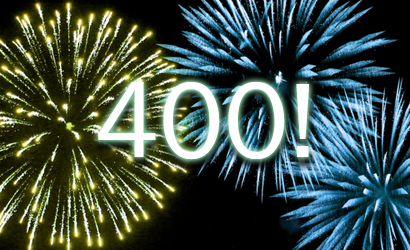 I realized that I have reached my 400th post, and it’s a significant milestone indeed! I always stopped to celebrate these milestones (even when I didn’t have a clear direction for my blog) and this happens to be a big one! I have written 400 posts since I started blogging back in 2012, not all of them are good, in fact some are pretty bad! And I’m not planning to change them one bit! They will remain as a reminder for me of my humble beginnings, and a measure of my improvement. I am glad I’m able to help people around the world with my blogging, it’s gives me a sense of achievement like nothing else to know that somewhere, I made someone’s day through my writing, the writing I have so much fun doing! I remember writing on my first post saying that I wanted to blog to share my knowledge with the world and provide solutions for problems I couldn’t find online, no surprise that the first two posts written in that concept were a hit! Over 3000 views for both on the very first day, how did it happen? I didn’t know or care much, I was busy doing my job and documenting what I encountered. I’m glad that at this time I know what I want to blog about, I’ve taken the direction of open source and just ran with it all the way! It’s my cause and what I want to spend my life working with..
What does the future hold for my blogging? I’m looking forward at my 500th post, I will try to enjoy the path and not think of numbers like I did now, and god willing I’ll take the pause to reflect on the 100 posts I’ve wrote. Good job! Keep writing! Soon you will be onto post number 1000!